Due to the increasing interest of girls wanting to be PA's and VIT's at our camp, we have had to change up our teen program a little. This means we have had to make this an application process. It is not first come, first serve. We will choose girls that we feel will be the best fit for our camp. 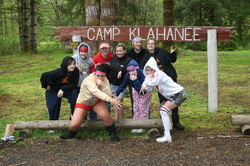 Girls who will be excited, positive, drama free leaders/role models for our campers. 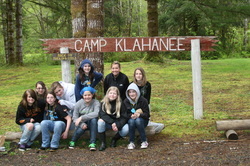 Girls who represent Girl Scouting and our camp in a positive way. Girls willing work hard with a great attitude. Girls who's goals are to provide a fun learning experience for the campers. Not all girls are at the same place in their journey. Some are more outgoing, more experienced, and have been PA's or VIT's for many years, some are brand new, and some are at that place in between with some stuff still to learn and/or some maturing to do. I didn't want to just play a guessing game and throw them all in a unit for the week and hope for the best. I really wanted to try to meet the needs of this age group more. To give them all room to breathe and room to grow. This program helps us meet the needs of these girls. Our goal is to give those who still have more to learn the opportunity to learn. Those who are still trying to find their fit and fine tune their skills, the opportunities to feel things out and try things out a little. And for those who have been at camp for years and really know their stuff, the opportunity to ROCK! We now have 3 levels at our camp. The girls move through the levels as they prove themselves to be hard working, responsible, respectful, outgoing, flexible, and knowledgeable of day camp life. School Band: A School Band girl is an incoming 7th grader or above, that has completed council PA training and attended the retreat. She is the new girl with an open mind and eagerness to learn as much as she can. They can help out with songs, games, and various camp skills. They want to work with the girls, but are not yet ready to be in charge. They are building the distinction between being a PA and being a camper, as well as their self confidence and working hard to come out of their shells. ​They work their way around camp experiencing a little bit of everything. ​They rotate around camp all week working in different units, helping with the craft stations, or being the directors/office assistants. 4. Camper Check In on July 7th @ 1:00. We will review skills, and set up camp. 6. Camper Check In on July 7th @ 4:00. We will review skills, and meet the campers. 7. Camper Check In on July 7th @ 4:00. We will review skills, and meet the campers. The level a girl is placed in depends a lot on her level of training, camping skills, knowledge, leadership skills, self confidence, self control, courage, attitude, willingness to help, and how she interacts with the girls, fellow PA's, and leaders. It is very important to us that we place each girl where we feel she will be challenged, but still shine as bright as she possibly can.